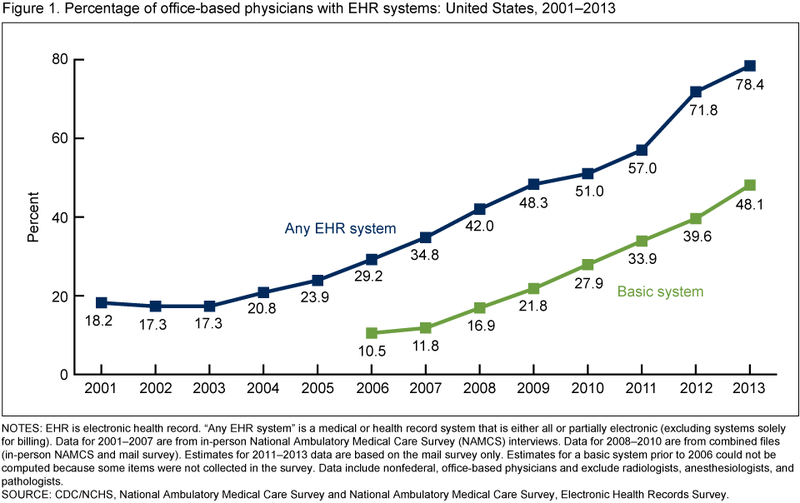 In 2013, 78% of office-based physicians used any type of EHR system, up from 18% in 2001. In 2013, 69% of office-based physicians reported that they intended to participate (i.e., they planned to apply or already had applied) in meaningful use incentives. About 13% of all office-based physicians reported that they both intended to participate in meaningful use incentives and had EHR systems with the capabilities to support 14 of the Stage 2 Core Set objectives for meaningful use. From 2010 (the earliest year that trend data are available) to 2013, physician adoption of EHRs able to support various Stage 2 meaningful use objectives increased significantly; however, many physicians who plan to participate in the program do not yet have systems ready. Besides reporting on all or partial EHR systems, physicians reported the computerized functionalities in their practices. Systems defined as basic include the following functionalities: patient demographic information, patient problem lists, clinical notes, orders for prescriptions, and viewing laboratory and imaging results. The adoption of basic EHR systems by office-based physicians increased 21% between 2012 and 2013, and the use of any type of EHR system by office-based physicians increased from 18% in 2001 to 48% in 2009 and 78% in the 2013 estimates; 2009 is the year the HITECH Act authorized incentive payments to increase EHR adoption. In 2013, 48% of office-based physicians reported having a system that met the criteria for a basic system, up from 11% in 2006—the first year that information on basic systems is available. However, the adoption of EHR systems varied widely across states. In 2013, the percentage of physicians who had a system meeting the criteria for a basic system ranged from 21% in New Jersey to 83% in North Dakota. 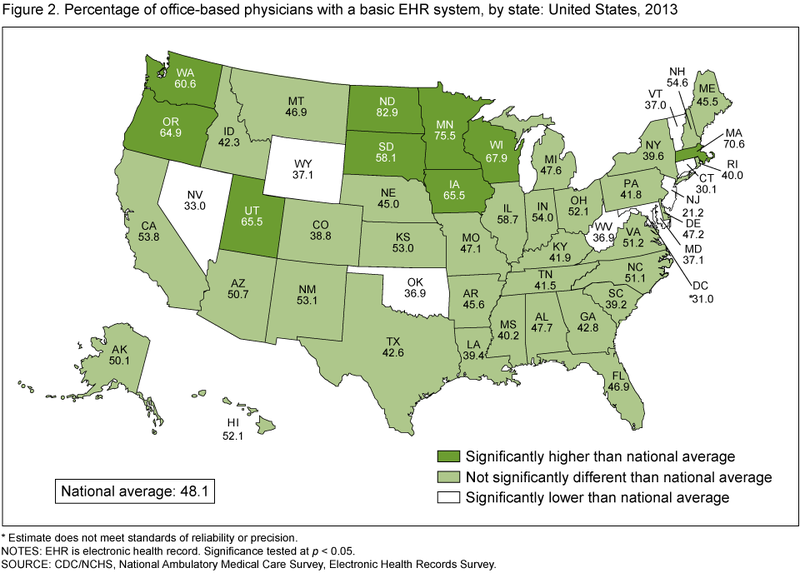 The percentage of physicians who had a system meeting the criteria for a basic system was lower than the national average (48%) in eight states (Connecticut, Maryland, Nevada, New Jersey, Oklahoma, Vermont, West Virginia, and Wyoming) and higher than the national average in nine states (Iowa, Massachusetts, Minnesota, North Dakota, Oregon, South Dakota, Utah, Washington, and Wisconsin). In 2013, the percentage of physicians using any type of EHR system ranged from 66% in New Jersey to 94% in Minnesota. And the latest figures show over 31% of physicians are uncertain or do not intend to participate in the Medicare or Medicaid EHR Incentive Programs as of 2013. I expect we may see some higher non-participation in 2014, and certainly an increase in the seeking of hardship exemptions. Only about 13% of all office-based physicians reported that they both intended to participate in meaningful use incentives and had EHR systems with the capabilities to support 14 of the 17 Stage 2 Core Set objectives for meaningful use. 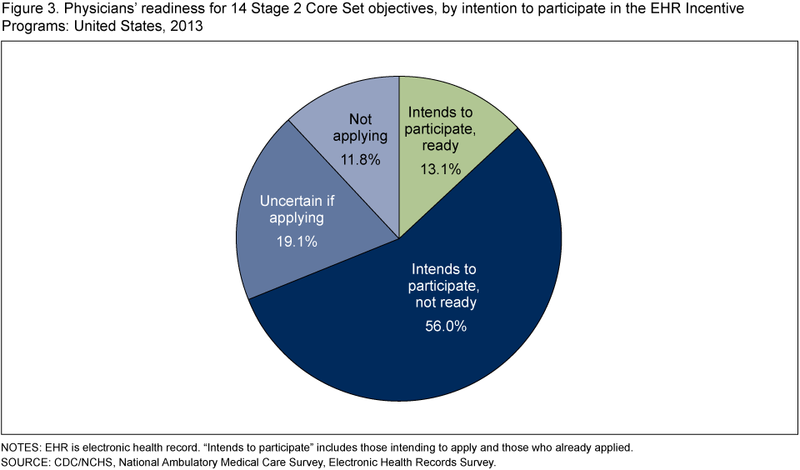 Fully 56% of physicians plan to participate but are not ready. There is little doubt we are making great progress in the adoption of EHR's, especially compared to five years ago primarily as a result of the EHR Incentive Program. While strides are being made there are challenges throughout the country, particularly in rural and underserved areas. And since many vendors are falling behind in meeting the certification criteria we are starting to see physician readiness to participate in meaningful use start to stall. As Karen DeSalvo said during our talk at HIMSS below, it is now time to pause and take a breath and take stock of where we are and chart the best path forward in driving towards the actual meaningful use of health information technology. I attended the 2013 Dell World Conference at the Austin Convention Center this past December. It was very interesting especially in light of Dell going private shortly before the event. During his keynote Michael Dell gave attendees a glimpse into his plans to catch up with the cloud and reinvent the firm he started years ago right up the road from where we met. Dell also announced a $300 million Strategic Innovation Venture Fund that extends its existing $60 million Fluid Data Storage Fund to cloud computing, Big Data and mobility. Startups in these areas now have a shot at funding, channel resources and go-to-market know-how from one the world’s largest technology companies. With its funds, Dell is making investments with other venture capitalists and strategic investors and acts as a board advisor and resource for the companies. These resources could be technical, business counsel or market strategy assistance. It will be very interesting to see how Dell continues to position itself in the rapidly evolving healthcare marketplace. During a video testimony at Dell World, Tenet Healthcare Corporation gave some glowing feedback on their over 20 year relationship. It was noted that the single biggest check Tenet writes each year is to Dell, primarily due to the IT services contract Dell inherited when it acquired Perot Systems. Last year Tenet's subsidiary Conifer Health Solutions also acquired Dell's Revenue Cycle Solutions line of business for hospitals and healthcare systems. This acquisition increased the annual patient revenue Conifer manages for its client hospitals to over $21 billion. There were a great many sessions as well as solutions on the exhibit hall floor they were geared towards healthcare. One of the best was a panel moderated by Dr. Andy Litt, Chief Medical Officer of Dell Healthcare and Life Sciences which you can view HERE (free registration required). In 2012 an intimate group of healthcare IT experts gathered at the HIMSS conference in Las Vegas for an evening of listening, collaboration and discussion about the challenges and opportunities that matter most to the healthcare IT industry. Then again in 2013 Dell hosted the second healthcare think tank, "The future of information-driven healthcare." These events were shared over a livestream broadcast where participants could attend virtually and submit comments and questions using the #DoMoreHIT hashtag on Twitter. Now this year, we are at it again with "At the Crossroads: Technology and Transformation in Healthcare." This time it is being held a few weeks after HIMSS in order for everyone to take a breath and digest the high points of conference. We will again be using the #DoMoreHIT hashtag and it will be broadcast on Livestream HERE. 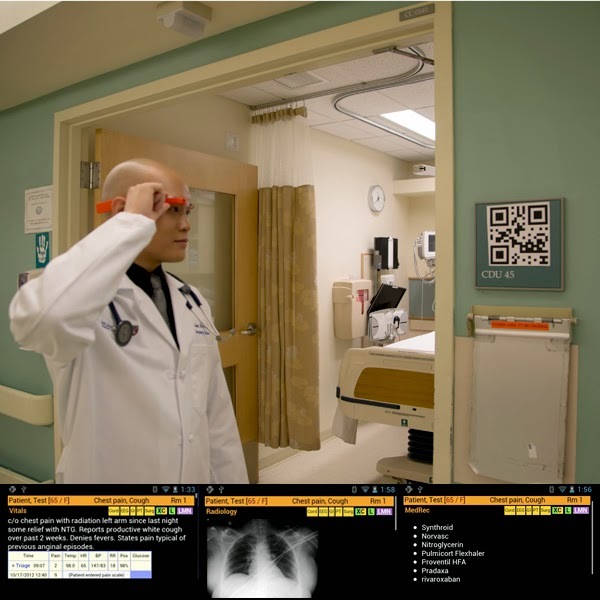 Google Glass could be a powerful tool for disruptive innovation in healthcare. I joined the Glass Explorer Program and have started using Google Glass with a focus on finding medical uses for this type of wearable computing technology. While I believe that it is analytics capabilities that will allow us to realize the value of health information technology, the convergence of hardware and software combined with an explosion of wearable sensor technology is providing powerful opportunities for some disruptive innovation in the healthcare marketplace and the practice of medicine. "There’s lots of interest in Glass use by surgeons, EMTs, and nurses, for hands-free and real-time access to critical information. It’s justified. But there’s also been negative speculation about threats to patient privacy. What will patients think when they see their physician wearing Glass. In my opinion, it will become just another tool they associate with healthcare workers (less obtrusive than the head mirror that used to be a symbol of the medical profession). The bigger question should be, what will physicians and others think when they see a patient wearing Glass?" I decided it was finally time to take the plunge and become a Glass Explorer and got my Google Glass just in time for the annual HIMSS conference to end. For those who have not yet seen Google Glass or don't understand how they work, it is basically a computer strapped to your head in the form of a pair of glasses. It has a heads up display, voice activation and growing number of apps. Check out the Google Glass homepage to learn more. When you think about having all of the technology of a smartphone, and then some, incorporated into a pair of glasses it boggles the mind as to the various use cases for healthcare. I want to outline just a few and then think about what other innovative possibilities this type of technology could bring to the industry. Last year Dr. Rafael Grossman, a surgeon and one of the Google Explorers based in Maine, used Google Glass during a Percutaneous Endoscopic Gastrostomy procedure. He was careful to not stream any sensitive data out via Google Glass and wrote about the experience on his blog. He said, "Obviously, the one of the main concerns regarding the use of Google Glass during surgery, with live streaming of data, would be to take every measure and to ensure the privacy of the patient’s health information." Using Glass in healthcare certainly faces some serious privacy and security considerations. But this technology also seems to be very well suited to solving some vexing industry problems such as emergency medicine, some surgery applications, and telemedicine to name a f.
John Halamka, MD pointed out to me that over the past few months, Beth Israel Deaconess Medical Center has been the pilot site for a new approach to clinical information technology, wearable computing. In the Emergency Department, they have developed a prototype of a new information system using Google Glass, a high tech pair of glasses that includes a video camera, video screen, speaker, microphone, touch pad, and motion sensor. When a clinician walks into an emergency department room, he or she looks at a QR code on the wall. Google Glass immediately recognizes the room and then the ED Dashboard sends information about the patient that is in that room to Glass. The clinician can speak with the patient, examine the patient, and perform procedures while still seeing problems, vital signs, lab results and other data in view on the Glass screen. Beyond the technical challenges of bringing wearable computers to BIDMC, there were other concerns: protecting security, evaluating patient reaction, and ensuring clinician usability. I appreciate the measured approach BIDMC has taken in developing the potential for Google Glass and am looking forward to seeing how this works out. An internal communication at BIDMC states that staff has definitely noticed them and responded with a mixture of intrigue and skepticism. Those who tried them on briefly did seem impressed. I would be very interested in knowing how patients respond. Already, even bars in San Francisco are banning Google Glass so I can imagine that as word gets out there will be some consternation among certain patients visiting the ER. However, they have fully integrated with their EHR's ED Dashboard using a custom application to ensure secure communication and privacy safeguards. They also replaced all the Google components on the devices so that no data travels over any Google servers and all data stays within the BIDMC firewall. They will soon begin a trial of Google Glass for all providers in the Emergency Department and study patient and clinician impressions, and the usage patterns of staff. "Over the past 3 months, I have been using Google Glass clinically while working in the Emergency Department. This user experience has been fundamentally different than our previous experiences with Tablets and Smartphones. As a wearable device that is always on and ready, it has remarkably streamlined clinical workflows that involve information gathering," said Steven Horng, MD MMSc who teaches at Harvard Medical School and works in the ED at BIDMC. After a patient presented with a massive brain bleed and was unable to communicate information concerning medications and allergies, there was serious danger to the patient. "Google glass enabled me to view this patient’s allergy information and current medication regimen without having to excuse myself to login to a computer, or even loose eye contact. It turned out that he was also on blood thinners that needed to be emergently reversed. By having this information readily available at the bedside, we were able to quickly start both antihypertensive therapy and reversal medications for his blood thinners, treatments that if delayed could lead to permanent disability and even death. I believe the ability to access and confirm clinical information at the bedside is one of the strongest features of Google Glass," said Dr. Horng via email. Google Glass is also being used at Rhode Island Hospital’s emergency department. As reported in the Providence Journal they will use Google Glass technology to stream live images of a patient’s medical condition to a consulting specialist located elsewhere. If this pilot is successful, project coordinator Dr. Paul Porter envisions an ambulance crew someday responding to a stroke victim, using the eyeglass technology to provide real-time video and audio to a neurologist back at the hospital who could then order a clot-busting, brain-saving drug immediately. "That would be like the Holy Grail," says Porter. "“But we’re just at the beginning; you have to start somewhere." Hospital spokeswoman Ellen Slingsby says the emergency room sees about 100 patients a month with skin afflictions who require a dermatological consult. That should be a sufficient pool of prospective volunteers, Porter says, to adequately test Glass in the next six months. The team proposed the research to the hospital and later received funding for the project and so far the results are encouraging. They are using a solution from start-up technology company Pristine which created a Google Glass application that protects patients and meets federal laws for privacy so that no images or videos can be saved to the device. Pristine makes the app EyeSight, which enables physicians and nurses to transmit live video and audio of wound patients from Google Glass to authorized computers, smartphones and tablets. Since last October, Pristine has also been testing EyeSight through a pilot program with surgeons and anesthesiologists at UC-Irvine. The technology allows for more effective communication between UCI anesthesiologists and surgeons in the OR and allows for greater supervision of doctors-in-training. "We could be supervising two residents at the same time," says anesthesiologist Leslie Garson. Garson also said Glass has proved useful during the 15 or so surgeries he has worked on so far, especially because he often monitors two or even three surgeries simultaneously. "A resident could have Google Glass on, they could be looking at a monitor, and I could have a tablet down the hall and could see exactly what they're seeing," he said. "They can send me an alert -- 'Take a look at this,' 'Is this something I should be concerned about?'" Dr. Patrick Hu (pictured at left) is an anesthesiologist at UC-Irvine and can share EKG information with other doctors via Google Glass. UCI Medical Center's anesthesiology department has been instrumental in pushing for this technology, according to the hospital. 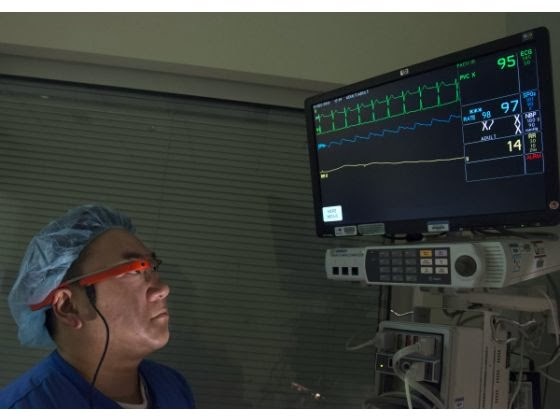 At UC San Francisco cardiothoracic surgeon Pierre Theodore, MD is using Google Glass during surgery. pre-loads CT and X-ray images needed for a procedure, and calls them up in his Google Glass to compare a medical scan with the actual surgical site. "Often one will remove a tumor that may be deeply hidden inside an organ – the liver, the lung – for example," said Dr. Theodore, who’s also an associate professor in the UCSF School of Medicine. "To be able to have those X-rays directly in your field without having to leave the operating room or to log on to another system elsewhere, or to turn yourself away from the patient in order to divert your attention, is very helpful in terms of maintaining your attention where it should be, which is on the patient 100 percent of the time." He is the first surgeon to receive clearance for the use of the tech device as an auxiliary surgical tool in the operating room by a local Institutional Review Board (IRB), an independent ethical review board designated to approve, monitor and review biomedical research involving human subjects. He was introduced to the idea by Nate Gross, M.D., co-founder and medical director of Rock Health, a San Francisco-based digital health accelerator. Last summer Rock Health's 5th class had a few winners who are focused on Google Glass and the digital health sensor market. Other uses for this technology begin to stretch the bounds of my imagination. Just about anything we are using mobile devices for in providing healthcare could be possibilities for using this type of technology. Bedside medication verification, accessing patient health information, and overlaying information at the point of care, as well as all of the interesting pilots underway now. I am just getting started using my pair of Google Glasses and connecting with folks in the healthcare industry who are pioneering this technology. The next couple years will be some exciting times on this front. I'd love to get your thoughts on what some of the challenges and opportunities are in using Google Glass in healthcare.